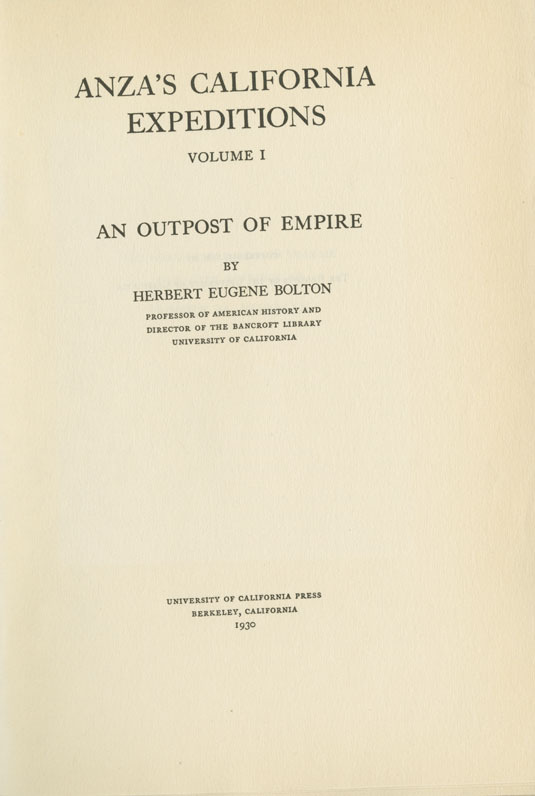 Bolton, Herbert Eugene , “Anza's California Expeditions ,” Arizona 100: Essential Books for the Centennial, accessed April 21, 2019, http://speccoll.library.arizona.edu/online-exhibits-dynamic/az100/items/show/195. In the third quarter of the eighteenth century, the Spanish Crown was sufficiently concerned about Russian exploration down the Pacific coast of North America that it felt the need to take immediate action. And so, in 1774, Juan Bautista de Anza (1735-1788) and three Franciscan padres, twenty soldiers, servants, cattle, mules, and horses set out from the Tubac presidio for the future site of San Francisco, California. Three of the volumes focus on Arizona: Volume 2, which reproduces the diaries of Anza and the three Franciscans; Volume 4, which contains Font’s diary (considered by many historians to be the greatest single diary of Spanish exploration in North and South America); and Volume 5, consisting of correspondence selected for its narrative value. --James J. Owens. 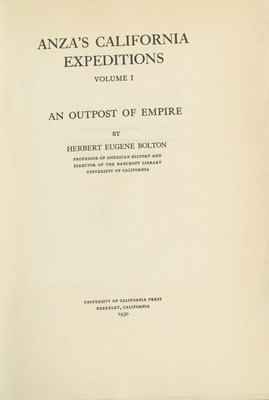 Berkeley : University of California Press, 1930. Reprint, New York : Russell and Russell, 1966. 5 v. illus., facsims., maps (part fold. ), ports. 23 cm.